Which Hot Tub Brand Is the Best? Posted on February 8, 2018 , in Hot Tubs. There are good hot tubs and there are not-so-good hot tubs. You can easily find out which manufacturers are reputable and which aren’t by researching online. Check out customer review sites geared towards hot tub users. Those reviews will provide insight into which brands customers tend to like and which ones seem to hold up over time. Many customers will also discuss their experience with dealing with the manufacturer’s customer service and repair process. You can and should also ask your friends and neighbors who own hot tubs whether they like their units. They can tell you which dealer to go to and other hot tub tips. Researching which features you want in a hot tub before you head to the dealer can save you from analysis paralysis or buying a model you don’t want. Once you have an idea of one or two brands you’d likely buy from, consider which features they offer and which ones would be crucial for your family. Some of these include how many seats, where you want it installed, and the hydrotherapy programs included. What you can generally assume about a long warranty is that the manufacturer stands by its products and that it won’t break quickly. You can research each brand’s warranty online. You’ll want to check if they cover the cost to repair, labour, and parts. Avoid warranties that require you to pay for parts out of pocket or are prorated. When you take the time to do the research on your hot tub, you reduce the risk of buying one that you ultimately won’t enjoy or regret. Finding the right model with the right features and warranty will guarantee you’ll enjoy your hot tub for years to come. 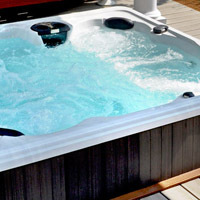 To learn more about how to purchase a hot tub, download our hot tub buyer’s guide.